Since WordPress 3.0, there has never been easier to create and edit navigation menus . This feature is nevertheless complicated to use if your theme does not support the location of menus. In this tutorial, we will see how to define a site of custom navigation menu. In other words, it will be possible to indicate directly from the module and Appearance menu, where it will be displayed by selecting one of the sites we have specified. Note: Be careful not to duplicate this feature if your theme supports this functionality natively. Therefore made a preliminary search using the Find command of your browser. As often, we need to edit the functions.php file in the folder / wp-content/themes/Your_Theme_name/functions.php accessible via an FTP client. You can also go through the module and then Appearance Editor to Menu. This snippet will create the effect of two locations for your theme and menu to initialize the function menu creations. Obviously, this technique presumes to have inserted into your theme, the function that will display the menu in question. This command will then display the Top Menu you can create / modify from the WordPress admin. A generally insert into the header.php file. You are now able to define the locations of navigation menus in your WordPress theme. Convenient, right? This Article Has Been Shared 9669 Times! This tutorial will show you how to set up a custom login page in WordPress. No special knowledge required. This snippet allows you to add a new column in the overview page of your blog articles to show the ID of your articles. KML Google Maps WordPress Plugins are easy way to integrate KML Google Maps in WordPress blog and also we have added the manual ways to Insert using PHP script. How to Make a Blog Successful depends on three variables – Plan, Execution of Plan and Energy to execute the plan. It is the plan that makes a Blog Successful. RSS to PDF File is not a new concept. Many peoples wrote about to convert RSS Feed to PDF File before. But the problem is the services are not constant. 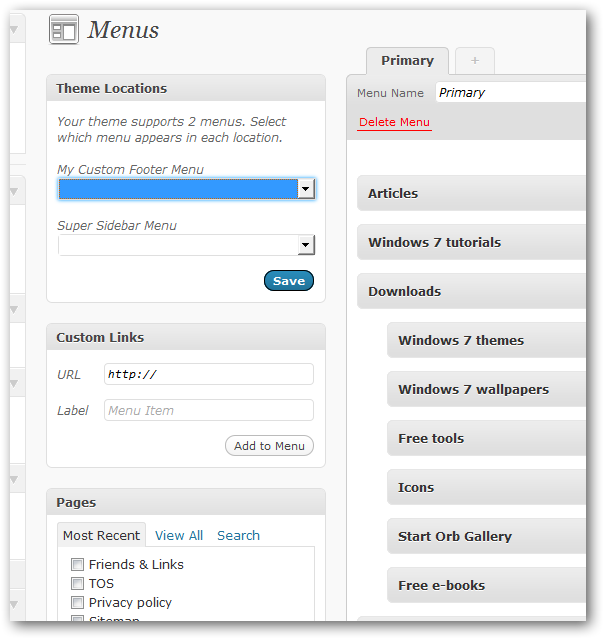 Cite this article as: Abhishek Ghosh, "Create a custom menu location for WordPress," in The Customize Windows, March 7, 2011, April 24, 2019, https://thecustomizewindows.com/2011/03/create-a-custom-menu-location-for-wordpress/.